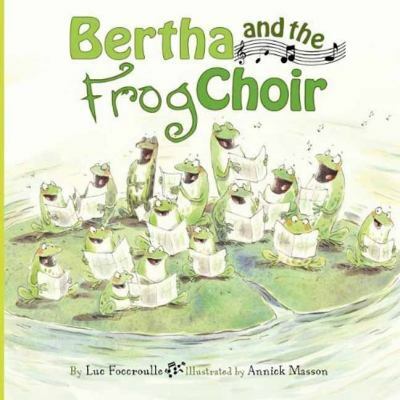 A recent book brought to us by our BLG reader Deborah was Bertha and the Frog Choir written by Luc Foccroulle and illustrated by Annick Masson. I admit I have a thing for fictional frogs. They have a certain charm and vulnerability that I find myself drawn to. I even blogged about it: Five Fantastic Fictional (Mostly) Frogs So when Deborah brought this book in to class, I was pretty excited! And it had us from the beginning – oh the poor frogs, described as flabby and slimy, not beautiful as so many other animals are. But. . . they redeem themselves with their chorus, their beautiful frog song! So what happens when you are a frog like Bertha who doesn’t exactly produce lovely sounds when she opens her mouth? Or a tiny frog like Lucy who isn’t even allowed to audition for the frog choir because she is so small? Well . . .
Bertha and Lucy sit at the edge of the pond, both sad and rejected. But then they start to get creative. Bertha could cook up a delicious meal to help Lucy grow and Lucy could give singing lessons to Bertha. Unfortunately, the plan does not seem to work. So the two clever frogs come up with a new plan. One that involves a trick. A trick that works perfectly. Perfectly, until both frogs get tired of pretending and decide that their true talents need to be recognized. A story that reminds us that good friends are as important as being true to yourself. There is a song at the back if reading this book puts you in the mood to sing. Twice, Deborah asked if we wanted to sing along. Each time the students exclaimed “No!” But each time they sang and the second time even louder and sweeter! This entry was posted in BLG Reads this week and tagged Annick Masson, BLG Reads, diversity, fiction, friendship, frogs, great read alouds, Luc Foccruoulle, picture books by carriegelson. Bookmark the permalink. This looks like a great book. I too am a huge fan of frogs, and in the ravine near where I live, they sing…very weirdly…each spring. Kind of duck-call sounding. I’m going to seek this one out.